Lindsey and Mark winter engagement session in downtown Chicago, by Millennium Park. I really like what weather throws at you. Somehow, the less is perfect, the best the pictures are. I shot Lindsey and Mark’s engagement late in december. I knew what to expect but I asked Ashley if she wouldn’t mind bringing some colors of her own. Therefore, when she told me that she was planning on a red coat, I knew we were on the right track. And we took from there. I personally enjoy Grant Park, mostly when it’s cold. It is one of those visionary man shaped spaces. During my first visit to Chicago, many years ago, I just couldn’t believe my eyes they had drained the whole river and placed a railway into it. 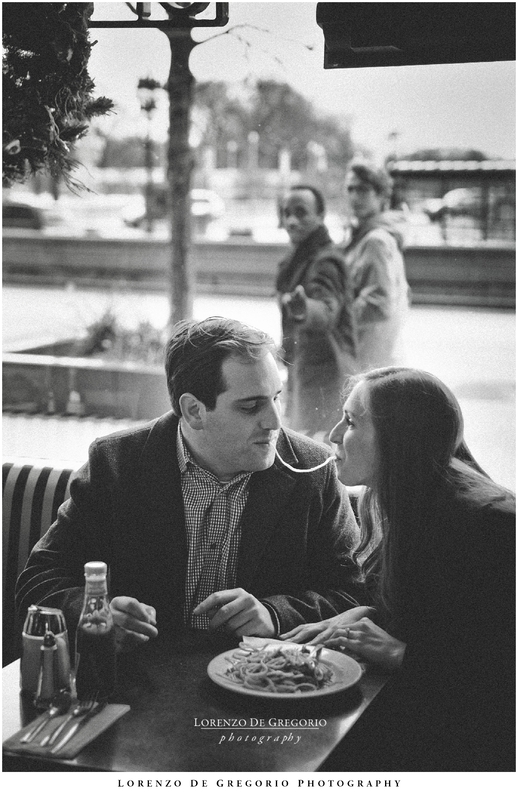 Lindsey and Mark having a Lady and the Tramp moment. I was looking for a Robert Doisneau moment instead and took a few frames until the two passer-by appeared in the background. And as they turned their heads I knew I had my shot. 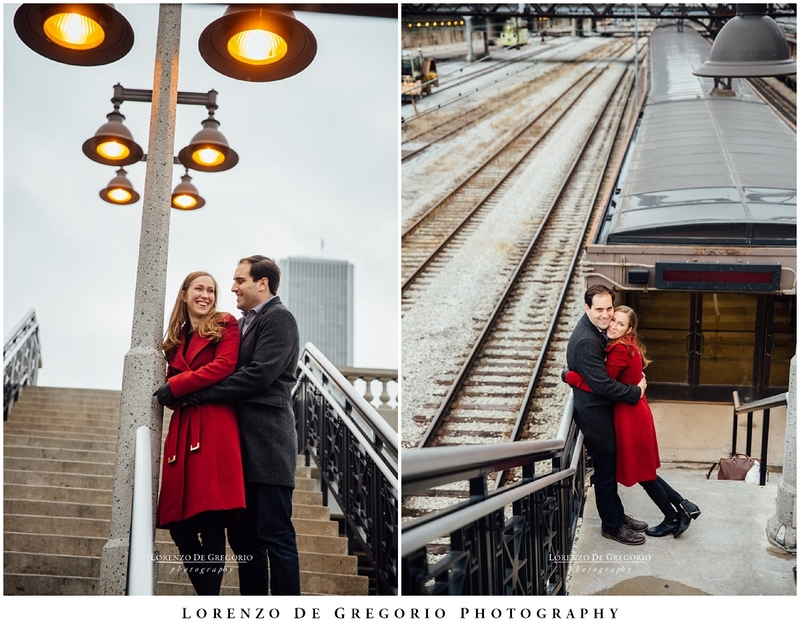 Downtown winter Chicago engagement photography with Lindsey and Mark. Lindsey and Mark in the Lurie Garden, late december. We finished our session by Kinzie bridge, crossing the Chicago river. If you liked this set of pictures, then you might love Se Won and Phil’s collection in downtown Chicago. 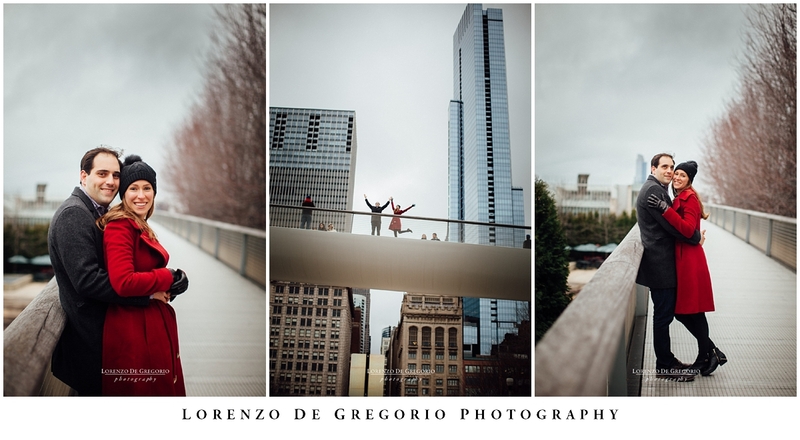 And if you are interested to a downtown Chicago sunrise engagement session, you should check Ashley and Dan’s shoot or Ashley and Chad’s Millennium engagement photos. If you are looking for something completely different, then browse the fall photos of Brittany and Matt at the Morton Arboretum.